The banana plant (Musa paradisiaca) is a huge, perennial herb. Its trunk consists of tightly wrapped leaf sheaths. Its true stem pushes up from the centre and grows flower spikes or buds. Blossoms grow into upturned ‘fingers’ and there can be as many as twenty in each bunch. Some plants have been in production for a hundred years. Its fruit was used even before the cultivation of rice. It is thought to come from East Asia and Oceania. 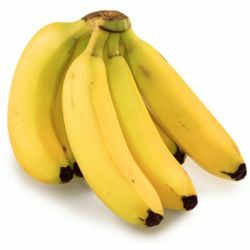 Bananas are packed with potassium and are a powerhouse of nutrition, containing many vitamins and minerals. They consist of 12% starch and lots of fibre, giving them the mucilaginous texture that we love. Fully ripened bananas have antifungal and antibiotic principles in both the peel and the pulp. They are emollient and highly moisturising, when applied topically. They soften the skin, making it flexible and pliable. We use fresh, organic bananas in our H’Suan Wen Hua hair treatment to give the product a thicker texture, while also softening the hair and giving greater control. In our Oatifix Fresh Face Mask, the bananas and the oats add a unique texture. The bananas also act as an emollient and moisturiser, softening the skin as the oats soothe and protect.